The philosophy of JLMC is to join new technology with time tested methodology in custom metal fabricating and manufacturing utilizing state of the art equipment. 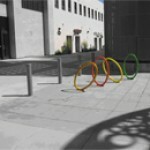 JLMC Metal Fabricating is one of the most specialized sheet metal fabricating companies in Southern California. We are a full service high quality driven manufacturing company with thousands of customers requiring a wide range of applications, from precision sheet metal fabricating to heavy metal plate up to ½”. Our brilliant sheet metal fabricating engineers along with skillful craftsmen in metal work provide the highest quality custom metal products. If you have a special metal fabrication design requirement please contact us to help with your specialty metal fabrication requirements. Metal Fabricating in Stainless, Steel, Aluminum, Inconel, Brass, P/O, Cold/Hot Rolled Steel and Plastic Sheet (Polycarbonate), Metal thickness range from 22 gage sheet thru 1/2″ plate. 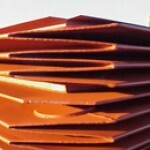 We understand that high quality and service are essential in today’s marketplace. 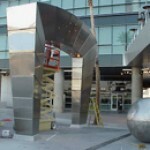 Our continued success can be attributed to the amount of skill and pride that goes into our production of your custom metal fabrication specifications. 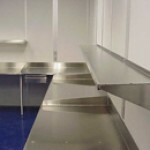 Let us know how we can help you with your next metal fabricating project. Visit our Metal Fabricating facility and take a tour. JLMC’s metal fabricating facility is in Ontario, California, San Bernardino County, between LA, Riverside and Orange Counties. While visiting our metal fabricating facility you will see automated CNC machining fabricating bare metal into complex metal parts and assemblies. 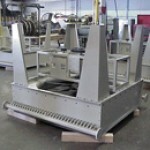 Custom manufacture, fabricator & designer of tanks, hoppers, cabinets, frames, enclosures & other metal parts & components from a variety of materials. Services include shearing, punching, laser, saw cutting, rolling, forming, design, installation, assembly, MIG & TIG welding, design & installation. Quality Control AWS Certified. 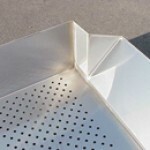 Our Scrapbook/Photo Gallery will provide you with the many applications for metal fabricating of unique custom sheet metal products and parts we have made over the years. From Replica Missiles to Geodesic Domes to simple Brackets and Frames. Our team of engineers is available to help you solve your metal fabricating production needs.